This week it’s competition time. Not once, but TWICE! A cover competition – for the chance to support me on tour! 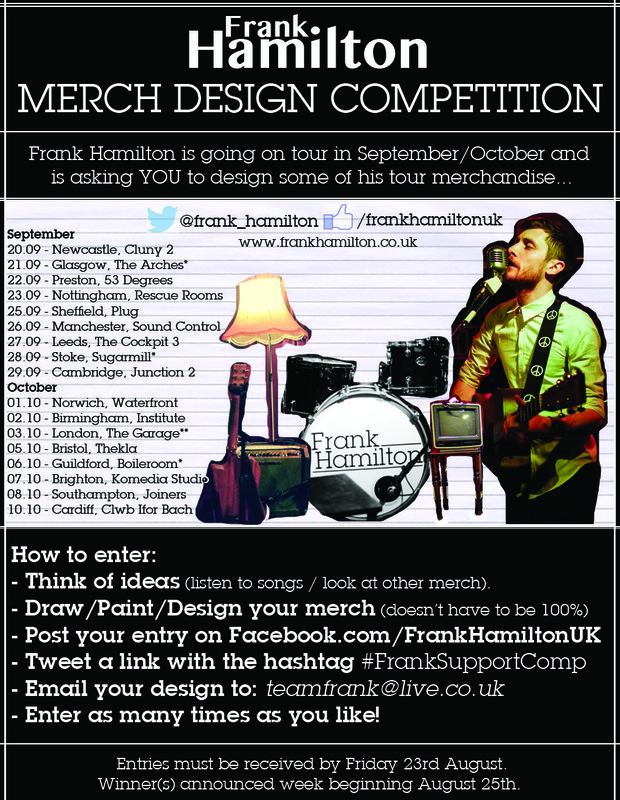 A merchandise competition – to design some merch for tour! Let’s start with the ‘SUMMER’ COVER COMPETITION. Learn ‘Summer’ (week 36 of #OneSongaWeek). Record a cover of ‘Summer’ in any style on any instrument (or even a capella)! Upload the cover to Youtube. 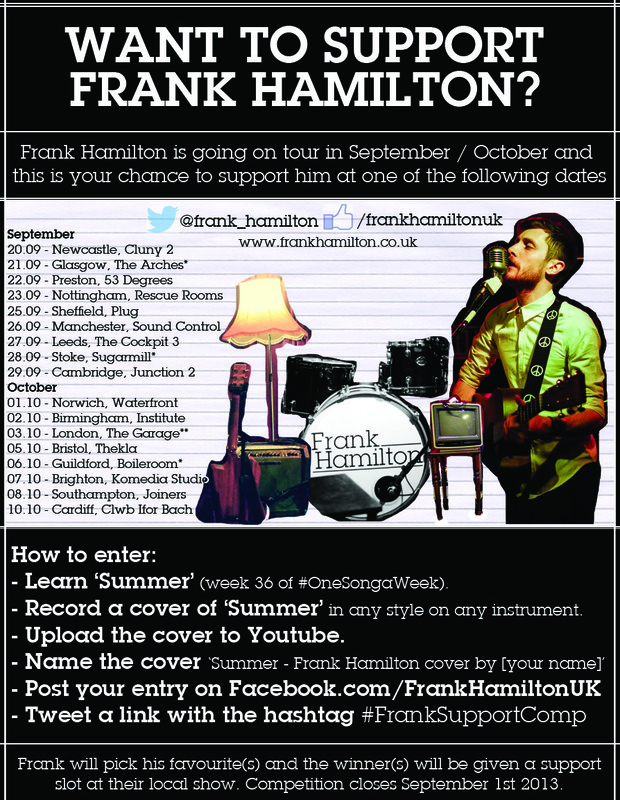 Name the video: ‘Summer – Frank Hamilton cover by [your name]’. To make things a little easier you can download the chords and lyrics to Summer (and a couple of other songs) for free on my Music Glue page (click here) and the song itself can be found on either Youtube or iTunes. I’ll be picking my favourite(s) and the winner(s) will be given a support slot at their local show on tour in September/October. Competition closes on September 1st! Below are my existing t-shirts and here’s a link to the shop with some other bits and bobs on. Your design doesn’t have to be in the same style as one of the existing ones (but it can be if you like). Play it safe or think outside the box, it’s up to you. Whether it’s a song, a picture, a lyric or something totally unrelated I’m already excited to see what you come up with! Also, your design doesn’t have to be a t-shirt. Socks, iPhone cases and Jumpers are all things I’m half considering – but ultimately it’s up to you. Get thinking / listening to songs / looking at other merch. Draw / paint / design your merchandise – It doesn’t have to be the finished article (yet)! The closing date for this is a little sooner. You’ve got until Friday 23rd August to get your first draft(s) in before we have a little focus group and see what everyone else thinks – and then we’ll announce the winner(s) on Monday 26th before finishing the design(s) and getting things into production. Printing with lots of colours is really expensive. Try and keep it to 1 or 2 (or 3 max) colours in the design. You can enter as many times as you like, with as many different designs as you like!